The Agalega is a group of two small islands, the North island which is the main island, and the South Island, located in the Indian Ocean, 1122 Km (697 miles) north of Mauritius. Both islands are part of the territories and dependencies of the Republic of Mauritius. Tourists are able to reach Agalega either by sea travel or by air travel. 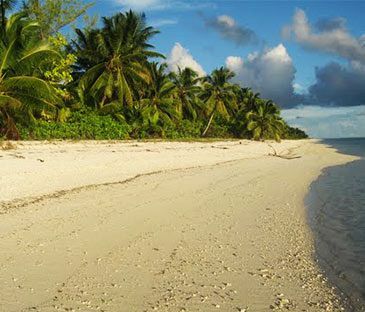 The islands have a total land area of 27 square miles (70 square km) and are separated by a stretch of sand bank. To move from one island to the other, the inhabitants can either walk across at low tides or wait for high tides and travel by boats. This is because the bridge that was being constructed by Auguste Le Duc in the past was destroyed by harsh weather. The North Island is 12.5 km long and 1.5 km wide and South Island, 7 km long and 4.5 km wide. The North Island is home to the islands’ airstrip. There are two villages, Vingt Cinq (named after the 25 lashes that were given to rebellious slaves), and la Fourche on North Island and Ste Rita the only village on South Island. Vingt Cinq is the centre of administration for both islands; most of the infrastructures are located there. La Grande Case is Agalega’s main administrative headquarter. The road network consists of sand tracks and there are some motor vehicles to move around. Light aircrafts can land and take off in the only landing strip of Agalega, in North Island, made of compacted coal and sand. No harbor exists so ships anchor in the high sea at some 500 meters from the jetty at St. James Anchorage, North Island. From up, Agalega appears what it is: a green jewel lying on the blue velvet of the huge ocean. Its natural beauty is simply captivating. Renowned for its Edenic coconut plantations, it is of no wonder that as you soon as you land on the island, you are welcomed by fresh coconut milk to drink offered by the villagers. Copra and coconut oil are produced for export, while animal husbandry, poultry and vegetables plantation form the prime source of livelihood of the inhabitants. You will also encounter one of its biggest attractions, the Agalega Island Day Gecko (Phelsuma borbonica agalegae), a lizard unique to the Agalega islands. It is an endemic species of gecko of about 140 mm length (female) to 170 mm (male). Agalega’s rustic charm will certainly leave a long-lasting, pleasant impact on you. 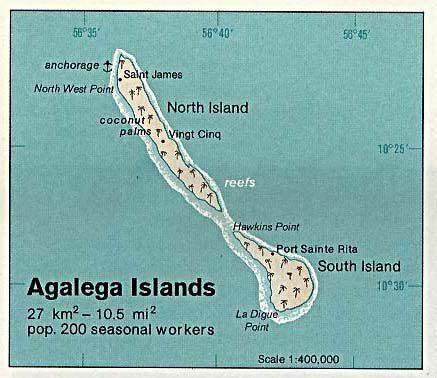 Agalega is believed to have shared its history with that of the other Mascarene Islands. It may first have been discovered by Arab and Malay sailors, although no official records confirm this. M. de Rosemond was the first person to have established a settlement on the island. The second wrecked sailor, Adelaide d’Emmerez, a Mauritian, is the one after whom the only mountain on the island is name, Montagne d’Emmerez. There were no economic, infrastructural and political developments on the island until the arrival of Auguste Le Duc in 1827, a French administrator sent by M. Barbé to organize the production of coconut oil and copra. Even as of today, this production is a flourishing trade. Remnant from this past, the period 1827 to 1846, can be still found in the form of historical monuments: the village of Vingt Cinq, the Slave Dungeons, a cemetery for Blacks and one for Whites, an Oil Mill. Today, the population of the islands is estimated at around 300 people, known locally as Agaléens. Creole is the main spoken language and Catholicism, the dominant religion. Despite having had limited connection with the outside world, it is interesting a fact that the origin of the inhabitants of Agalega has been greatly influenced by the political situation in the world in the nineteenth century; the English reign in Mauritius, the abolition of slavery and the indentured labourers from Asia. Legends are the spirit of lands. At Agalega, the “Calèche Blanc” and “Princesse Malgache” will take you closer to the folklore. Another unifying element is the coded language of “Madam langaz Seret”, a mixture of French and Mauritian Creole which has come down from the time of the slaves. In this language, every syllable is doubled with the first consonants replaced by the “g”, for instance, "Français" becomes "frangrançaisgais". The origin and purpose of this quite peculiar language are not known. Until recently, there was no money in circulation on Agalega, though residents shopped at the island’s two shops. Payment was done by signing government vouchers which were debited to the payer’s salary account. Thefts would be so rare, almost non-existent, that everybody slept with windows opened.